Ever wondered what film and video editors get up to in there little dark rooms? Well, you may find out here. Throughout my career I took photos of my workplace and colleagues. As a result I have literally thousands of prints, slides and negatives. Some of this archive is now of historical interest, and constitutes a personal history of video tape recording, and editing. I started digitising it when I made the first version of this website, and in 2015 began a concerted effort to work through the entire collection. This site will be used to show photos and stories about my career. 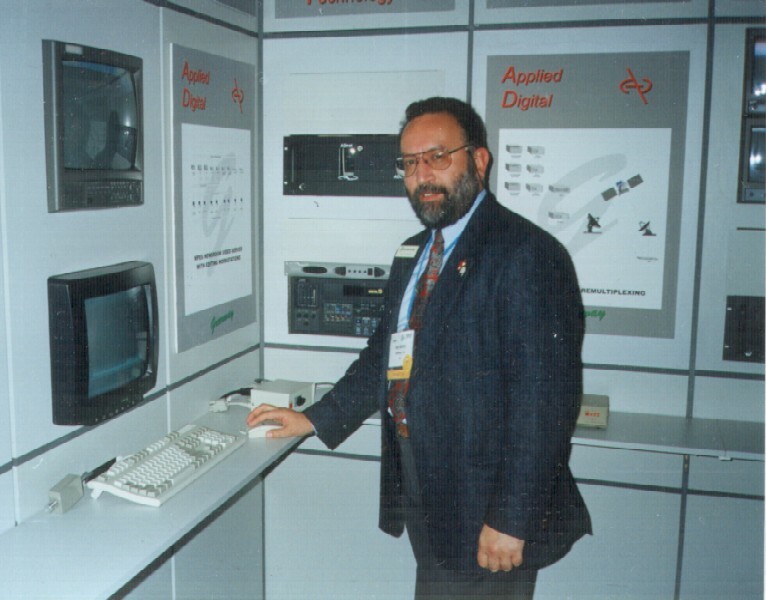 Here I am demonstrating a server based MPEG Broadcast Transmission system, which included recording, editing, transmission, and multiplexing functions. 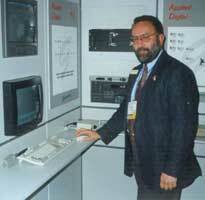 The photo was taken on the Greenway stand at IBC '96 in Amsterdam. This was intended for automated playout of Broadcast TV and we had versions for both programmes and commercials. Click on the photo to see the full-size version.